Choc Chip Digital is now offering video production services! We’ve been very busy these last 3 months working behind the scenes and now we are ready to reveal our brand new service offering, video production! Watch the video to see some of our latest work. 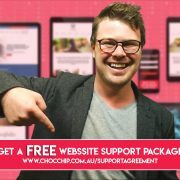 https://chocchip.com.au/wp-content/uploads/2017/11/CCD-Video-Promo-Time-0_00_0123.jpg 1080 1920 dev https://chocchip.com.au/wp-content/uploads/2017/03/logo-white-transparent.png dev2017-11-23 15:06:272017-11-23 15:08:48Now Offering Video Production!